A couple of weeks ago I made short ribs for the first time and loved them so much that I decided to buy them when I saw that they were on sale again. 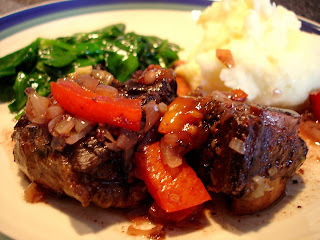 I decided to try another recipe I found on epicurious.com for braised short ribs with dijon. I made this on a Wednesday night which was a bit ambitious, but working from home has its perks! The total cooking time from beginning to end is three hours. I was able to start things around 4, but this is definitely more of a weekend meal. I followed the recipe exactly and was happy with the final result. The meat flaked right off the bones and was full of flavor. The sauce could have used a bit more dijon which I'll be sure to add next time. I made mashed potatoes and sauteed spinach as sides. I changed up my potato recipe just a bit - I used Yukon Gold potatoes which are very buttery on their own instead of my usual red potatoes which can have a sweet taste. I mixed in some whole milk, just a bit of butter, Kosher salt, and about 2 tbsp cream cheese. The sauce from the ribs was perfect over the potatoes!